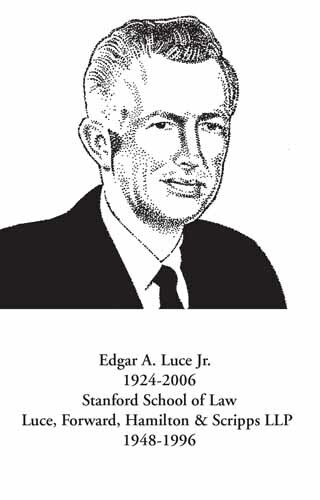 For over 50 years, Ed Luce was not only a fine lawyer, but also one of San Diego’s great civic leaders, integral to both the San Diego community, and the success of the law firm founded by his grandfather Moses A. Luce in 1873, currently named Luce, Forward, Hamilton & Scripps LLP. In his practice, Mr. Luce specialized in business law, commercial litigation, bankruptcy and workers compensation cases. He served as the firm’s Managing Partner from 1978 to 1983. His significant involvement in the legal community included serving as vice president and director of the San Diego Bar Association, and a member of the Executive Committee of the Conference of Delegates. He was a Fellow of the American Bar Foundation, an arbitrator for the San Diego Superior Court, an arbitrator and mediator for the American Arbitration Association and an arbitrator for the New York Stock Exchange. He was the recipient of many awards including the Whitney North Seymour Sr. Award, and the Mexican and American Foundation Frontera Youth Role Model Award. He was very active in Republican politics. For over 35 years, Mr. Luce coached in the Presidio Little League, and had a field in Mission Valley named in his honor. He had an unrivaled passion for Stanford University athletics and led the University’s Buck/Cardinal (Booster) Club, serving as a board member and as regional chairman of fundraising for athletic scholarships. He was involved with the San Diego Senior Olympics, where he not only competed in the high jump and tennis but was also a member of the Board. He is survived by his wife, Barbara Remy Luce, and their four children. His warm personality was reflected not only in his family but also in his legion of friends. He enthusiastically carried on the leadership in the San Diego community started by his grandfather, Moses Luce.